Register for the podcasting workshop at our Kamehameha Education Technology Conference and you could be one of two winners of an iPod Nano! There’s still time to register for our 3rd Annual Kamehameha Education Technology Conference that will take place at the Neal Blaisdell Center on June 9-10, 2008! WILL RICHARDSON and DAVID WARLICK, we have a great line up of local speakers that will be sharing classroom strategies and experiences for integrating new technologies. Interested in motivating our net generation students? Join us in this session to learn about a variety of online resources and technology tools our distance learning team have found useful and available at your fingertips to integrate into your classroom. 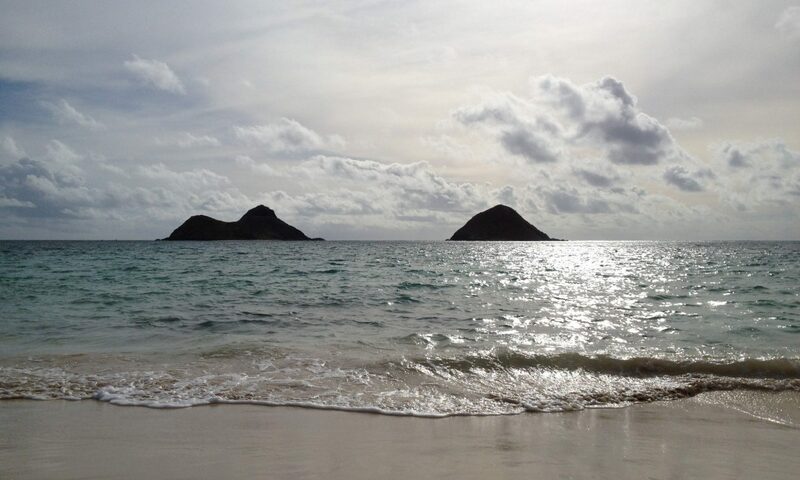 In this session, we will also be sharing with you some exciting Kamehameha Schools distance learning programs available to educators, high school students and adults. In this presentation, KSH teachers will share their experiences with Web 2.0, specifically using VoiceThread and Wikispaces. As we all strive to meet the needs of our 21st century learners, we are focused on creating authentic assignments for a real audience: the world. What did we learn as educators? What did our students learn as producers of text? And how might you use VoiceThread and Wikispaces with your students, no matter what the age. This presentation will take us through the entire process of creating a video project with an Apple computer to broadcast on TeacherTube using the following software: Pages, Safari, GarageBand, iTunes, iPhoto, iMovie, QuickTime, TeacherTube, and YouTube. Are you a web 2.0 newbie? You’ve come to the right place. This session will give you an overview of essential web 2.0 apps for teachers, students, and everybody else. Find out what’s “out there” and how this next generation of web tools can revolutionize your teaching and learning. Please plan to join us Monday, June 9 – Tuesday, June 10, 2008, for our Kükulu Kaiaulu (Building Global Communities) Education Technology Conference. This year’s conference will again feature internationally known and respected leaders in the field of education technology. This is a chance to hear speakers who have inspired educators around the world to effectively use technology as a tool for enhancing teaching and learning. By attending the conference you will gain a perspective on the impact of technology in education today, as well as participate in practical, hands-on activities that will prepare you to effectively integrate technology into your curriculum. More information will be posted as soon as it becomes available. 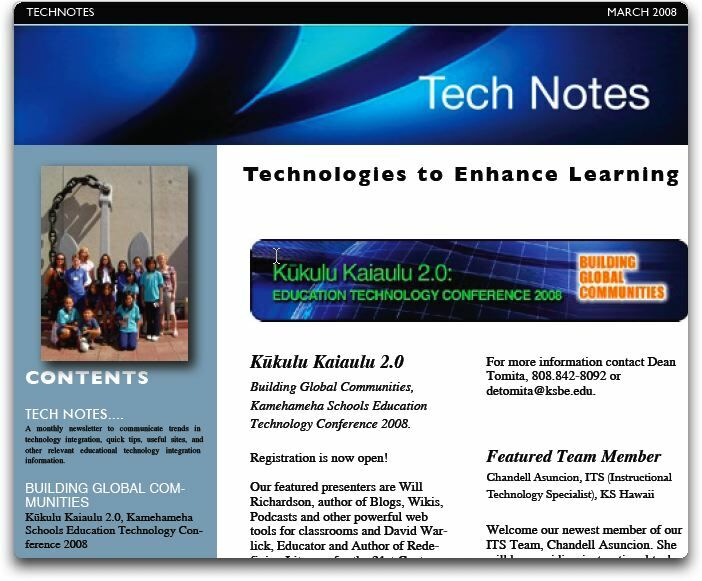 Please mark your calendars for the KS Ed Tech Conference: Kūkulu Kaiaulu 2008 which will be held June 9-10 on Oahu. Will Richardson will be one of our featured presenters. Will is “Learner in Chief” at Connective Learning and the author of the recently released Blogs, Wikis, Podcasts and Other Powerful Web Tools for Classrooms published by Corwin Press. If you’ve never heard Will present before, you won’t want to miss this oportunity to hear one of the foremost experts in the area of blogs, wikis and podcasts. Please check back in January for more information about the conference. Please contact Dean Tomita if you have any questions.